A Concert To Benefit Nutley Family Service Bureau. Please join NFSB for a rockin’ live show at the Old Canal Inn, 2 East Passaic Avenue, Nutley on Saturday evening, April 22nd. 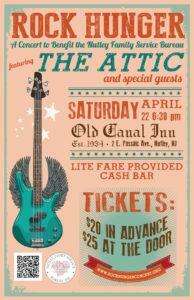 Headline band The Attic along with special guests will be bringing down the house! Light-fare food, great tunes, and a chance at a progressive 50/50 Raffle are on tap! Proceeds will benefit NFSB programs and services, including the Food Pantry. A great time will be had by all for a great cause! Tickets are $20 in advance and $25 at the door. Cash bar. For sponsorship, please contact Eileen Painter, Executive Director, at 973-542-8277 ext. 2 or VIA EMAIL. REGISTER YOUR TICKET NOW AND/OR MAKE A DONATION! 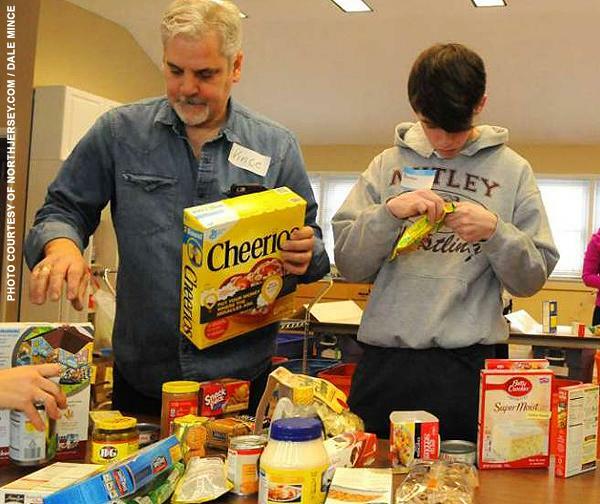 About ten years ago, the Nutley Rotary Club started working with local Boy Scout and Cub Scout groups coordinating non-perishable food collections. Walt Smith of Nutley continues to head the effort for Scout Pack 141 and 142 and Troop 147. In 2017, the first year of NFSB Food Pantry operations, the Scouts collected over 13,000 items in a single drive. This year, the Scouts are collecting during the week of March 22nd. Shopping bags are dropped off on neighborhood stoops and stairs, to be filled with pantry staples such as tomato sauce, tuna, mac and cheese, peanut butter and jelly. Nutley Family Service Bureau is thankful to the Scouts for stocking the Food Pantry and to the generous Nutley residents who contribute. For more information about volunteering, Please call (973) 667-1884. As April is Volunteer Appreciation Month, NFSB would like to offer an early and heartfelt thanks to all of the many wonderful people who generously offer their time and talent in supporting NFSB’s dedication to community service. Their efforts are key to the successful operations of both the Food Pantry and the Thrift Shop. Particularly, there is a core group whose dedication and longevity is astounding. 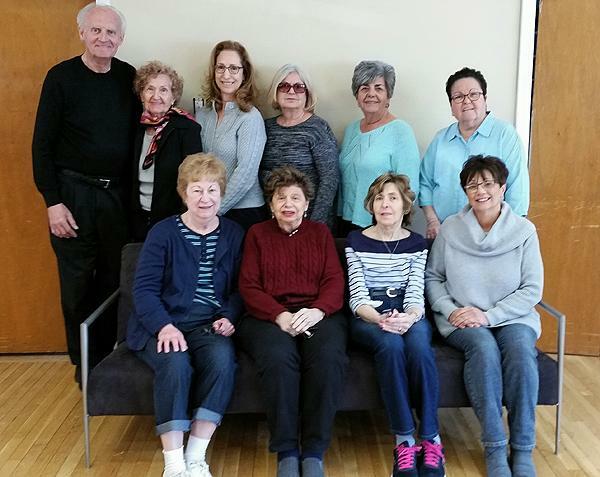 They are the former members of the NFSB Ladies Auxiliary, (disbanded in 2013), who among them have accumulated 400 years of service to the Thrift Shop. NFSB appreciates the energy that every volunteer puts forth to helping the agency make a positive impact on the well-being of individuals and families in the community! 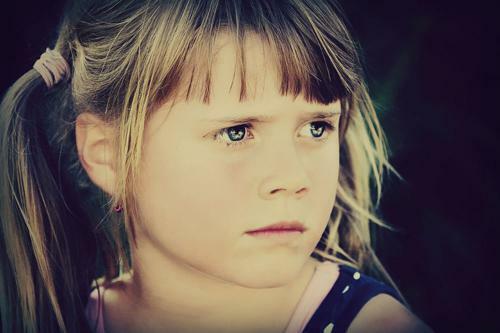 NFSB offers Play Therapy for children working towards better socio-behavioral interactions, emotional regulation, and trauma resolution. The therapeutic model uses toys, art supplies, and games to elicit children’s thoughts and feelings. It is available to the youngest of children and provided by our staff specialist in child therapy, Ann Goldstien MSW, LCSW in conjunction with the family’s primary therapist to ensure an integrated healing process for all family members involved. Ann Goldstein, MSW Rutgers University, LCSW, holds a post-graduate certificate from Fordham University in Child and Adolescent Therapy and utilizes a play therapy approach to intervention when working with children and their parents. Ann has been a valued staff therapist at NFSB for over 25 years.